The Bafana Bafana preliminary squad was announced this morning and Matthew Savides was there for us. British-based duo Kagiso Dikgacoi and Dean Furman looked to have cemented their places in Bafana Bafana’s Africa Cup of Nations squad, following an announcement made by coach Gordon Igesund in Durban this morning (TUESDAY). At a press conference at the Moses Mabhida Stadium, Igesund named a largely unsurprising, midfielder-dominated 36-man squad that will be cut down to a final list of 23 on December 30. But speaking to the media afterwards, Igesund intimated that Oldham Athletic captain Furman and Crystal Palace midfielder Dikgacoi may have already made the final cut. “I went to England recently and spoke to both managers, and both agreed to allow them to come on the 1st (of January). They will be here…in time for my initial camp in Cape Town,” Igesund replied when asked whether or not the players had permission to join the squad during a special training camp between December 27 and 30 given the demands of the English league fixtures over Christmas and New Year. His answer indicates that – since the Afcon squad will be announced before the two are released to the Bafana set-up – they will almost certainly feature in the African soccer showpiece. Bongani Khumalo also looks to have his place sewn up, with Igesund saying he would likely to the team’s captain during the tournament. The coach named 24 players who will due duty in Durban against Malawi on December 22. A further 12 players will join the squad for the pre-New Year camp in Johannesburg. While Furman and Dikgacoi are listed among those 12, it now appears they will join the team later. The squad is made up of four goalkeepers, 11 defenders, 16 midfielders, and 5 strikers. 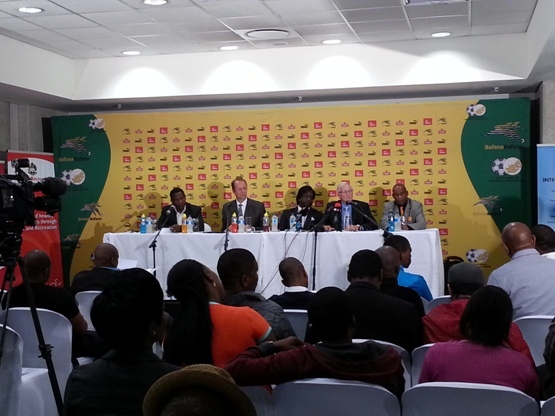 Igesund said it was about finding the balance ahead of the tournament. “I’ve got the get the balance right. I can only take 23 players, so I’ve got to make sure we’ve got cover in all departments, not only the striking department. I’ve got to make sure we’re got the right defenders on the field, and the right midfielders on the field, and players who can score goals,” he said. The only possible surprise to the squad is the inclusion of Ayanda Patosi, the Belgium-based midfielder. He might be just 20 years old, but if this goal for his team Lokeren FC against Standard Leige is anything to go by, he looks the real deal. There is also place in the team for Benni McCarthy and Katlego Mphela, both of whom made their comebacks from injury for their club teams at the weekend. Igesund warned, however, that they face “a race against time” to prove their fitness. But there isn’t place for last year’s Player of the Year, Siyabonga Nomvethe, whose long-term tow injury has seemingly ruled him out for sure. 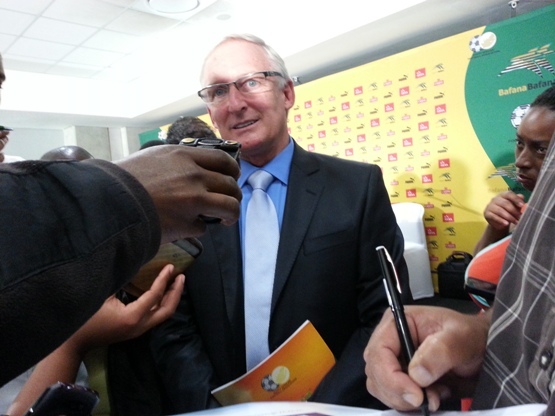 Igesund said he was delighted with the attitude of the players that had made the squad. “There are a lot of players that put their hand up and said, ‘I want to play for Bafana Bafana’, so the competition has become fierce – and that is very important because we have to select a team that really wants to play for us,” he said. Now it’s just about narrowing the team down and finding the right combinations. “I cannot wait for January 2. This will be the first time I’ve had all my players, all day. This is when I can really mould this team,” he said. Bafana Bafana take on Malawi at the Moses Mabhida Stadium on December 22, with kick-off at 5pm. Tickets went on sale today and are available via Computicket.